I used to work with this guy that grew up in Louisiana and despite the fact that we kept all these gourmet coffees in the office kitchen, he’d bring in bags of Community Coffee. 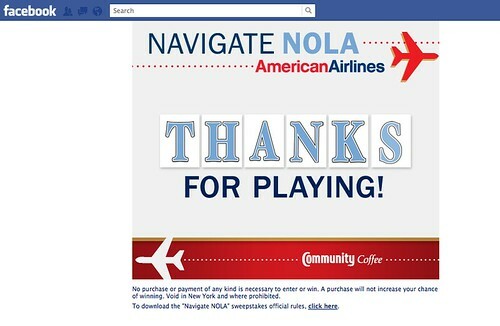 Want to win a trip to New Orleans? Test your knowledge of The Big Easy and enter to win! The winner receive 2 American Airlines travel certificates good for travel anywhere in the lower 48 states and a $3,500 gift card for travel expenses. What national historic park in new orleans has the oldest collection of oak trees in the country? What music festival has taken place in new orleans every spring since 1970? True or False: The Mercedes-Benz Superdome is the world’s largest fixed domed structure? It’s one entry per person and the deadline to enter is 11:59:59 p.m. CT on March 31, 2012. You can find the complete rules here (warning, it opens as a PDF in your browser). Thanks for the tip. 🙂 Just entered. Hi Debbie – Thanks for reading and leaving a comment. Good luck with your entry! Hi Robyn – Good luck! Hi! We love New Orleans AND Community Coffee! I just entered-Thanks! !